West Los Angeles CA business address and mailbox rental provides many services such as mail & package forwarding . West Los Angeles private mailboxes are your very own, virtual mail assistant. 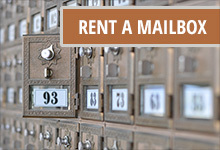 Rent a Private High Quality PO Box & Mailbox right across close to West Los Angeles! Blocks from the 10 and 405 Freeways on the corner of Ocean Park Blvd. and Centinela Ave. Blocks from Bundy Ave. in the city of Los Angeles and zip codes 90066, 90064 and 90025. Unlike traditional Unites States Post Office PO Boxes our private mailboxes include 24 hour access to your mail and packages and personable individualized service. We send you digital images of the mail in your mailbox and upon request can open, scan and email your mail to you. We have been serving the residents of West Los Angeles for over 30 years. Open a PO Box in West Los Angeles today to enjoy the same quality and service. We have taken the private mail box rental system to the next level of optimum service and innovation. The days of rushing to your mail box to see if important mail has arrived are over, especially if you discovered that urgent piece of mail had not arrived. Wasting time in West Los Angeles traffic, rushing around between meetings, just to retrieve your mail in business hours is past. Our private service of mailbox rentals in West Los Angeles offers superior 24 hour service with attention to the finest detail. Open a P.O. Box in West Los Angeles CA today. Our supreme service and extra attention to detail is the ultimate support for your business schedule. Our company has been in business since 1983, building 36 years of trust with our loyal and ever expanding customer base. We have identified the unique need of each customer and built a private West Los Angeles mail box service to suit those requirements. Keep your West Los Angeles CA box for the life of your business and know your highly valued mail is safe with us. A P.O. Box, private mail box for West Los Angeles CA, with a prime business address. Location is always key to your professional image. Our West Los Angeles business address rental is the simplest solution to your prime location requirements in the crowded city. Our private mail box rentals in West Los Angeles CA offer you 24 hour access to your mail. We understand that your busy schedule needs to be alleviated and not everything can be done from 9-5. We have catered to your hectic schedule by giving you 24 hour access to your mail and packages. When your mail arrives, we immediately send you a text message alerting you to the delivery. Taking this service even further, we then photograph the cover of your mail and send these images to you. This gives you immediate notice of what has arrived in your mail box. You no longer have to expectantly drive to your mail box for a package every day, until it is actually delivered. Should you find yourself in an urgent situation where you cannot retrieve your mail and you desperately need to know the contents of a letter, upon your instruction, we will open the envelope concerned, scan it in and email the letter to you. It’s the simplest, most amazing system. Turning your physical mail into virtual mail. Do you need a dedicated fax service? Our business service offers you the use of our West Los Angeles CA fax number. Print it on your business cards and save. Are you out of town? Have you moved your home or office? We offer a mail and packaging forwarding service using UPS or Fedex, once a month, upon your request, all your mail items can be sent to you. Your personal security is our concern; our West Los Angeles CA mail box lobby is locked and monitored by security. When you hire your West Los Angeles private mailbox, we issue you with a key to gain 24 hour access to the secure lobby. Package Lockers are bigger mail boxes situated in our West Los Angeles CA lobby. Give us a call or send us a message and we will store the big package in one of these lockers for you. The key will be waiting in your private mailbox. You can retrieve any size parcel 24 hours per day. This is a complimentary free service for our valued and cherished customers in West Los Angeles. You are welcome to call us during office hours and check on your mail, we will immediately let you know what has arrived in your mailbox. With services like these you confidently know that your post and packages are secure and well looked after. Contact us and rent a mailbox or PO box in West Los Angeles CA today, don’t miss out on the prime location for your business address.